The Birmingham Barons and Dale’s Seasoning have partnered together for the past seven years to help with the essential transportation needs of local area children with their “Pitch One for Kid One” fund-raising promotion. 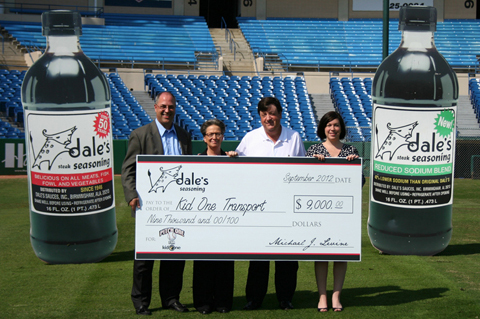 With their donation of $9,000 in 2012, the Barons and Dale’s Seasoning have donated a total of $52,500 over the past seven years. Kid One Transport is an innovative program that has served the children of Alabama for over fifteen years, while being the only nonprofit transportation provider of its kind in Alabama. Since its inception in 1997, they have provided more than 220,000 transports, which ensure that children receive the medical care they need. Kid One serves expectant mothers and children with a wide variety of health care needs ranging from routine medical checkups, dental screenings and mental/emotional health services, to critical, specialized care such as radiation, chemotherapy and dialysis. 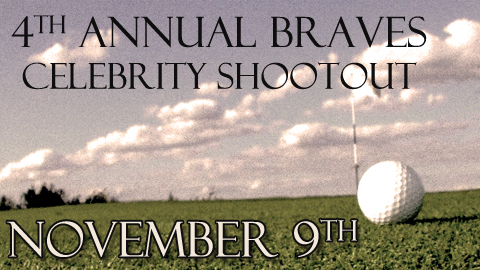 The Rome Braves and Floyd County Police Department announced today the date for the 4th Annual Braves Celebrity Shootout to benefit the Wounded Warrior Project. The day will consist of registration and driving range at 9:30am, a shotgun start at 11am, followed by an awards reception after the tournament. Food and drinks will be provided. The golf tournament will be held on Friday November 9 at Stonebridge Golf Club in Rome. Teams or individuals can register at the Floyd County Police Station or at the ticket office located at State Mutual Stadium, home of the Rome Braves. Hole and team sponorships are available as well. Celebrity participants include members of the Atlanta Braves coaching staff as well as minor league field staff. Past participants have included current Atlanta Braves third base coach, Brian Snitker, former Rome Braves manager and current Gulf Coast Braves manager Rocket Wheeler, current Rome Manager Randy Ingle, and former Rome Braves players. The Wounded Warrior Project is an organization dedicated to raising awareness and enlisting the public’s aid for the needs of injured service members; to helping injured service members aid and assist each other; and providing unique, direct programs and services to meet the needs of injured service members. For more information, please contact the Rome Braves at (706)369-9388 or Gary Conway at the Floyd County Police department (706)235-7766. Click here to download a registration form now! This article originally appeared on the official website of the Rome Braves. Click here to view the original story. Baseball season may be over, but the Marauders are still busy staying involved in the local community. Players, front office members, and mascot are still busy putting forward a great effort to make a positive contribution in Manatee County. Marty the Marauder was in attendance on Saturday, September 15 as the Miracle League of Manasota held their opening day for the fall 2012 season. Six teams and more than 90 registered players took part in three games at the new Miracle League fields that opened earlier this year with financial support from the Pittsburgh Pirates and the Baltimore Orioles. Congratulations are due to 2012 Marauder Casey Sadler and 2010 Marauder Tim Alderson for earning recognition for their tremendous community service during the 2012 season. Sadler was the Marauders’ Pirates Community Commitment Program Award winner this season. Alderson received the award with the Altoona Curve. Both players were recognized at PNC Park last Tuesday before the Pirates game against the Brewers. Manager of Florida Operations A.J. Grant raised more than $1,000 for the Muscular Dystrophy Association by participating in the local MDA chapter’s Lock Up event at Pier 22 Restaurant. More than a dozen donors helped A.J. raise that lofty amount for a great cause. 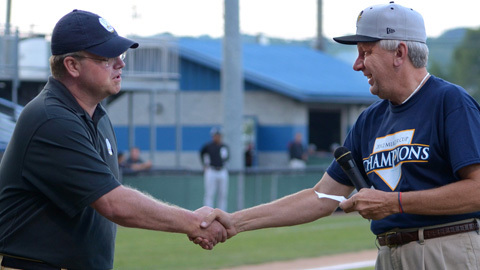 The numerous successes enjoyed by the Princeton Rays in 2012 many times extended beyond the foul lines due to a heavy involvement by the team in events that lead to a better community and surrounding region. “It’s very important to our organization to use our avenue of baseball to be a charity partner in the region when possible. We also want to help develop our players in this aspect of their professional baseball careers,” shared P-Rays’ General Manager Jim Holland in reviewing the season just completed. The P-Rays, in addition to providing Hunnicutt Field as a venue for canned food drive events at two separate home games this past season, had over half the team participate in a unique related project this past summer. August 9 and 10 saw 16 P-Rays’ players spread out over two mornings to four different locations of the area’s Grant’s Supermarket stores to bag groceries for customers. The players, who wore their jersey tops for the event, encouraged customers entering the stores to buy extra canned food items for those in need. As the players bagged groceries, the extra cans purchased were collected and placed in a donation area to be contributed to Tender Mercies Food Pantry. Upon the event’s conclusion, Tender Mercies reported that the overall two-day donation was the largest they had received to date in 2012. Taking it a step further, upon completion of their shift, several Princeton players went back into the store and additionally purchased groceries to be donated toward the cause. “The event we conducted with Grant’s was really very meaningful to all of us. It’s one of the more unique things we have done in a while and we are very much looking forward to being involved with Grant’s next year and raising those numbers more,” said Holland. The season just concluded marked the third time in the last four seasons that the team wore specialty hats on a targeted game date to be auctioned for a specific charity. After suffering a rain-out on the originally scheduled date of July 14, the game of August 11 served as a successful evening for “Coal Heritage Night.” During this game, the P-Rays’ were able to raise $1,372.00 via a game cap auction that was donated to “Remember The Miners,” a non-profit organization formed to spread awareness about the importance of the coal mining industry and create scholarships for deserving students. The Princeton squad during that game wore very attractive P-Rays’ logo caps designed in coal colors of black and gray. As the game progressed, all players and coaches hats were being made available to everyone in attendance (and even some fans nationwide bidding by phone) via silent auction. Following the game, each winning bidder in attendance was brought on the field to receive their game-worn cap personally from each player and coach, who in turn autographed the cap for the recipient. Twelve days later, at the August 23 home game, all in attendance were treated to an appearance from “Remember the Miners” co-founder Jason Solomonson, who drove from Charlotte, NC to receive the check on behalf of the organization in an on-field ceremony. “Remember the Miners is obviously a very important charity to anyone that lives in this region as we especially know the effort miners put forth to power this country through the mining of coal. It is a vital industry and we were honored to be involved. We also want to include a thank you to The Shoppes at Willow Crossing for purchasing the hats to be used. The folks at Fairchild International also made it a very special night and we had several interns that worked hard to make it an evening to remember with a coal theme,” commented Holland. The list of places that P-Rays’ players showed up this past summer was endless, stretching from appearances at the summer “Energy Express Reading Program” at Mercer School to being ambassadors at the “2012 State Junior League Baseball Championship Tournament” hosted by the Greater Princeton Little League at nearby Gardner Field. They visited with the young at the Princeton Recreation Center’s Day Camp to the young at heart at Princeton Health Care Center as part of an outdoor luncheon for the residents on a beautiful August afternoon. And, even further beyond the P-Rays’ player roster, the organization conducted many other events at home games during 2012 highlighting awareness for many other charitable endeavors. This included hosting groups such as firefighters, police officers, EMS workers, active and retired military personnel, members of scouting as well as children from daycare centers. Princeton Baseball Association, Inc also worked in 2012 with the Jonathan Powell Hope Foundation (awareness and prevention of pediatric cancer), Second Chance Learning Center, and Ed Randall’s Bat For the Cure, an official charity partner of Minor League Baseball that targets the awareness and prevention of prostate cancer. As the area’s focus now turns to thoughts of next summer’s Appalachian League season, be on the lookout for the 2013 edition of the Princeton Rays to materialize at a community function near you. TROY, NY- The Rensselaer County Regional Chamber of Commerce held their annual Van Rensselaer Awards dinner to honor local businesses who have shown outstanding support to their community.The Tri-City ValleyCats were honored with the Van Rensselaer Small Business Award in recognition of their commitment to the Capital Region community. ValleyCats Vice President/General Manager Rick Murphy graciously accepted the award on behalf of the ValleyCats organization. Other winners include CAP COM Federal Credit Union, who received the Van Rensselaer Corporate Award, and Neil Golub received the 2012 Edward H. Pattison Citizenship Award. This past season the ValleyCats donated to over 350 charitable organizations, volunteered their time with reading appearances at local libraries, led the Community Grounds Crew youth field renovation program and more. This article originally appeared on the official website of the 09/20/2012 10:02 PM ET. Click here to view the original story. Nine military-based, local non-profit organizations received a total of $33,000 from OceanFirst Foundation as part of the 2012 Home Runs for Heroes program in conjunction with the BlueClaws and WOBM. Through the program, which just concluded its fourth season, each time the BlueClaws hit a home run at FirstEnergy Park, $1,000 is donated from OceanFirst Foundation to one of nine organizations. Each organization is tied into one particular inning. This year’s leaders were Army Emergency Relief of Fort Dix and Fort Monmouth (first inning) and National Guard State Family Readiness Council (second inning), which each received $7,000 for seven home runs hit in their respective innings. The four-year total for the program is now $108,000. Checks were presented to the organizations at a FirstEnergy Park ceremony on September 18th. “Ocean First Foundation is proud to partner with the Lakewood BlueClaws and WOBM to honor and support local veterans and the servicemen and women who protect and serve our country here at home and abroad. We had another great year of home runs and OceanFirst Foundation is proud to support these great organizations,” said Katherine Durante, Executive Director of OceanFirst Foundation. BlueClaws 1B Chris Duffy and 3B Maikel Franco each hit seven home runs at FirstEnergy Park to account for $14,000 of the $33,000 donated this season. 1B Jim Murphy, who hit seven home runs in Lakewood in 2009 and 11 more in 2011, has accounted for $18,000 in donations and is the program’s all-time leader. This article originally appeared on the official website of the Lakewood BlueClaws. Clock here to read the original story. Binghamton Mets officials joined Dunkin’ Donuts franchisees to donate 200 pounds of coffee to the Food Bank of the Southern Tier prior to the Mets’ final game of the season on Labor Day. The donation – the equivalent of more than 10,000 cups of coffee – was fueled by a season-long partnership between the Mets and Dunkin’ Donuts. During the 2012 season, Dunkin’ Donuts pledged to donate one pound of coffee to the Food Bank for every double play turned at home by the Mets. Led by a cast of infielders, Binghamton recorded 52 double plays at home to generate a 52 pound donation of Dunkin’ Donuts coffee to the Food Bank. Dunkin’ Donuts and its Southern Tier franchisees contributed an additional 148 pounds to bring the total donation to 200 pounds of Dunkin’ Donuts coffee. Each week, over 11,000 individuals visit a hunger-relief agency served by the Food Bank of the Southern Tier. In 2011, the Food Bank distributed nearly seven million pounds of food to neighbors in need across the six Southern Tier counties of Broome, Chemung, Schuyler, Steuben, Tioga, and Tompkins. The Dunkin’ Donuts and Binghamton Mets partnership has included a number of fan and community initiatives at NYSEG Stadium during the 2012 season. L.P. Frans Stadium was the recent site of a Yello Dyno Training session where children ages 4 through 10 learned strategies to keep themselves safe. Yello Dyno teaches children about tricky situations such as child abduction, molestation, bullying, and other forms of victimization by utilizing an active, but non-fearful format of instruction. Children attending the training learned that a “tricky person” may come in the form of someone they don’t know or, more often, someone they do know. Kids were empowered by recognizing when someone, stranger or not, is trying to trick them into doing inappropriate things. The program taught the kids how to approach the appropriate people for help if they are lost, and learned the right questions to ask when faced with difficult situations. Crawdad’s General Manager, Mark Seaman had this to say about their decision to sponsor the training, “We appreciate the Children’s Advocacy and Protection Center of Catawba County allowing us to partner with them on this program. We feel like the ballpark is the perfect environment to educate our children on the potential dangers that unfortunately exist in our world. We feel every child should be exposed to this type of information and we challenge all groups that have involvement with kids to reach out to the Children’s Advocacy and Protection Center of Catawba County and find out how they can get involved and get their kids access to these programs”. Deborah adds that none of the trainings would be possible without volunteers like Dr. Stacy Briggs, Pediatrician, Yello Dyno Trainer and CAPC Board Member, who introduced “Yello Dyno” to the community several years ago. Stacy, along with Josh Page, owner of Hickory Academy of Martial Arts, and volunteer Debbie Dunn are also big believers of how empowering this training is to our kids. The Crawdads look forward to holding another training session next season. This story originally appeared on the official website of the Hickory Crawdads. Click here to read the original story. The Boise Hawks have been patiently waiting for their trip to St.Lukes Children’s Hospital and it finally happened yesterday. 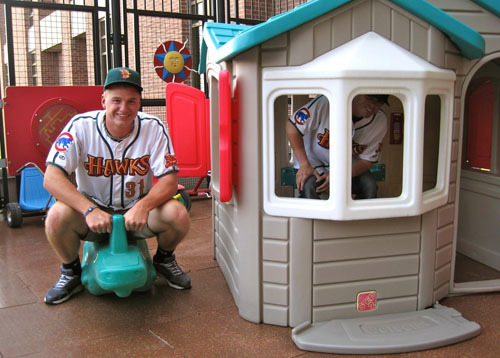 Michael Heesch, Stephen Bruno and Dan Vogelbach went to St.Lukes and visited with the children on the fourth floor. They handed out hats, baseballs, helmets, balloons, foam fingers (Bruno’s favorite) and flower arrangements that the boys put together themselves at In Bloom Tuesday morning. This story originally appeared on the “High Heels and Highlights” blog. Click here to read the original story.